With Stranded on the Path, The Clouded Lights showcase a sound that’s very much rooted in the distinctly post-millennium revisioning of the post-punk sound, in the vein of early Interpol, Editors, et al, as well as contemporaries both regional (The Exhibition, for example) and international (New York’s New Politicians come to mind). So, there’s a real precedent, and a sense that The Clouded Lights are part of an expansive zeitgeist. Increasingly, it feels like that zeitgeist exists under the shadow of the apocalypse: the fear of the mushroom which loomed large over the 1980s is in many ways reborn in the 2010s (which still don’t sound like a real decade, but what can you do?) It’s an observation I’ve made previously, but the point is worth restating: the parallels between the early 1980s and the present are astounding – and depressing – and it’s small wonder that so much contemporary music echoes the sound of 30-odd years ago. One of the key elements in the bands of the original new wave – Joy Division in particular, but listen to any of the darker, gothier bands, like Danse Society, Skeletal Family and you’ll find the same stylistic features – is strong, dominant drumming. 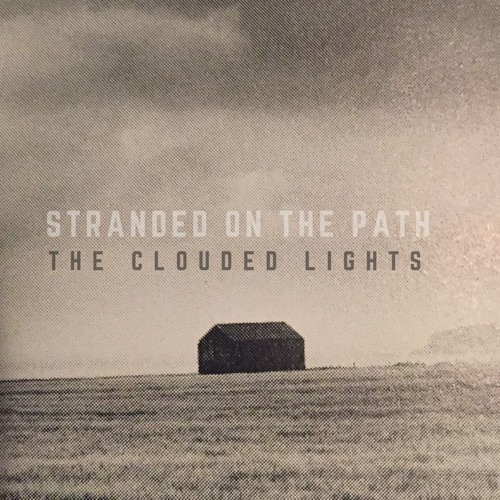 The Clouded Lights have nailed the drumming, with a percussion style that’s urgent, tense, and, importantly, tight. The EP’s first track, ‘Borrowed Hearts’, is arguably the strongest and an obvious choice of lead, which balances bounce and bleakness, and is propelled by a busy, bluster-filled bassline that brings energy. I’m a sucker for songs driven by rolling tom-led drumming, and the slower ‘Barter With the World’ ticks the box nicely. Chiming guitars and a vocal melody which casts melancholy shades define the song, and across the EP’s four tracks, there are some strong harmonies. While shaded with heavy hints of darkness and defined by spindly, fractal guitars, Stranded on the Path is by no means a wholly bleak, pessimistic release, and the strong choruses and a leanings toward more uptempo material means it’s a release that’s inspiring, rather than a soundtrack to hang yourself to. It’s also a strong set, which suggests that, with live dates booked for the new year, The Clouded Lights could well be ones to watch in 2017. Like this song. Could be a hit!